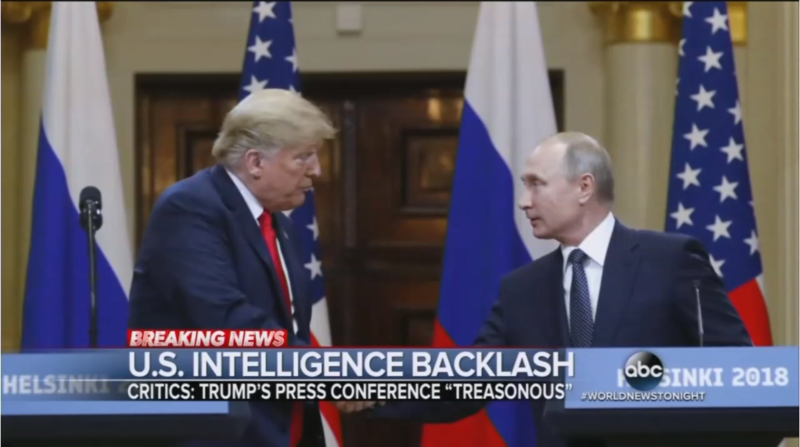 During Monday’s edition of World News Tonight, ABC demonstrated what they really thought of President Trump when they pushed political accusations that he committed an act of treason during his press conference with Russian President Vladimir Putin. It’s highly disturbing that they would push such an accusation and they were the only broadcast network irresponsible enough to actually do so. What made their elevation of such a theory even more troubling was that the punishments for treason include the death penalty. In addition to pushing accusations of treason, ABC also pushed speculation that Russia had some sort of dirt on the President and was blackmailing him with it.